Despite the Progress spacecraft failing to dock at the International Space Station, those aboard are still in good spirits saying they have “plenty of supplies,” while they are also looking forward to meeting a new space tourist, they told RT. Cosmonaut Mikhail Kornienko from Russia and US astronaut Scott Kelly spoke to RT on Wednesday about life onboard the International Space Station (ISS). They said they still have plenty of food, oxygen and other supplies to last them until the next Progress supply ship is due to dock in June. “Anytime you lose a spacecraft you don’t feel good about it, but we have a good amount of supplies onboard, so we are well positioned up here,” said Kelly, who spoke to RT from a special link-up from mission control. His colleague Kornienko was similar upbeat and added that it was not the end of the world. The pair, along with four other astronauts onboard, have been getting used to a new coffee maker which was transported to the ISS last month. It includes specially designed zero-gravity cups; while they added that the fresh espressos certainly make a welcome change from the instant coffee they had to put up with. However, with only 15 servings, they will have to use the espresso maker sparingly. “It’s more of an experiment, rather than something for us to use on a daily basis,” Kelly said. The crew is soon set to be joined by space tourist Sarah Brightman. The 54 year-old singer is set to perform a song on board the ISS that she composed with former husband Andrew Lloyd-Webber. None of the crewmembers say they will engage in a duet with the British soprano, however, but they both agreed it will be good to have some new company. “Anytime you get new people up here it is a change. This is one of the things that we enjoy flying up in space is the different human contact and human relationships. 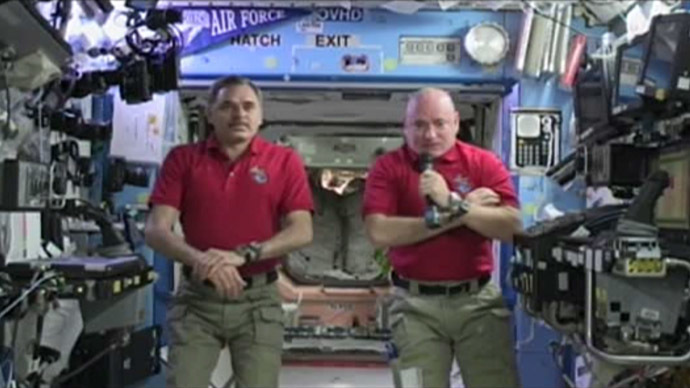 Whether it is a tourist or an astronaut or cosmonaut all visitors are welcome and we enjoy having them,” Kelly said, when asked about her arrival in September. The astronauts and cosmonauts have plenty to keep themselves busy, as they are carrying out experiments. However, Kelly added that it is too soon to know how successful they will be as the large amounts of data they have collected will need to be analyzed back on Earth.